Creating Shared Value is a concept originated from Harvard business review article called “Strategy & Society” by Harvard Business School professor Mark E. Porter and entrepreneur Mark Kramer in 2006. The concept revolves around businesses using innovation to focus on increasing the economic value for the company as well as fulfilling societal needs in order to achieve success and legitimacy within societies. Companies need to identify and cater to pressing social issues while maintaining profits and maintaining trust within the society as companies are dependent on each other and the society to mutually succeed. Porter and Kramer believe there are markets that have not yet been developed where products can fulfil a much demanded societal need. Companies should reconceive their products by producing products or services to consumers who have not been able to get access to it and reinventing the market so that it would fit the use of their products. In order to modify the product and the market so both sides would mutually benefit, innovation is needed to best achieve CSV. Kramer and Porter also believe that many societal problems can create economic costs, increasing the internal costs of a company. By altering business practices to improve productivity through better allocation of resources, increasing employee productivity, addressing societal issues, companies can create shared value as these societal needs are met, and companies can benefit from the lesser overall cost. Companies often rely on other companies to do business, forming a cluster of companies interacting with one another. In order to achieve creating shared value, Kramer and Porter suggest increasing the skillsets, supplier base and other institutions within the industry to escalate productivity, innovation and growth. The main idea is that if one company becomes more efficient, others in the same industry or business would as well. Creating shared value is viewed as a potential way of generating profits by tackling social issues, which will in turn boost economic growth. Shared value emphasizes on maximizing the competitive value of finding solutions to social issues within the industry, cost savings and talent retention. More and more companies are reconstructing their business strategies by including CSV now. While many companies had previously thought that growth of business and creating positive impacts in society are contradictory, CSV proved this theory otherwise and encouraged many companies to implement this business model. This new strategy gives these companies a competitive edge and helps them build trust with stakeholders outside of the company. This makes them stand out with the industry by making them a more socially responsible and economically successful company, particularly as the world is growing to become more socially conscious. 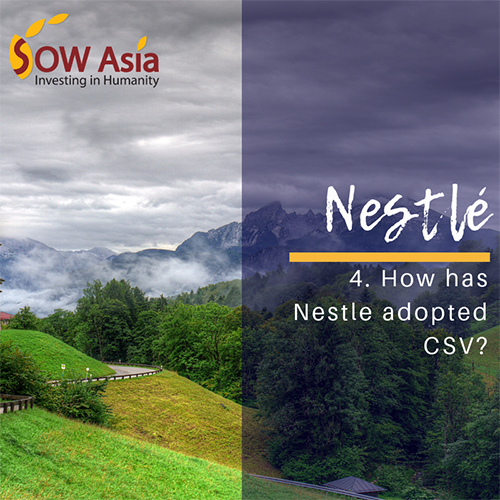 Nestlé is a great example of a company using the CSV framework as it supports certain long term goals like nutrition, water, food security, environment, human right and much more, in line with the U.N.’s 2030 Sustainable Development Goals. Nestlé believes in focusing on the positive impact to create a healthier and joyful lifestyle for individuals, communities, and the environment, with an aim of helping at least 50 million children, 30 million people in communities, and reducing all negative environmental impacts in their business practise. Nestlé achieves CSV by communicating with their stakeholders including but not limited to those in the academia, customers, suppliers, and the government, to identify areas that required improvement. Moreover, Nestlé also collaborates with organisations such as Alliance for YOUth and EpiGen Global Research Consortium to better serve the CSV aim for mutual success within society. As apart of the CSV initiative, Nestlé awards a prize called “The Nestlé Creating Shared Value Prize” every two years. The award is given to encourage social enterprises and NGOs to embrace creating share value and to raises awareness of the challenges in nutrition, water and rural development. The most recent joint winners of the prize are Egyptian healthy food cook and delivery company ‘Mumm’ and Filipino fishing sustainability company ‘Fishers and Changemakers’.